Oct. 17, 2016: David Boxley stood amid light rain and diesel fumes at Samson Tug & Barge in south Seattle. He was taking receipt of an 8,000-pound log that he had never seen but which would become perhaps the most important totem pole of his nearly 40-year career as a carver. An internationally recognized Native American artist, Boxley had conceived a totem pole that would honor the life of Cindy Sue James, who had died of cancer a month earlier at Northwest Hospital in Seattle. Cindy, 52, had been a longtime friend and member of Boxley’s Tsimshian dance troupe – and later, after Boxley married Cindy’s sister, she was family, too. Boxley had entrusted another carver, a longtime friend, to find an old-growth cedar log from southeast Alaska near Prince of Wales Island. It had traveled down the coast by barge and now sat on a flatbed trailer near the Duwamish River. The Western cedar log arrives in Seattle, chained to a barge. Almost 30 feet, the log was weathered and gray, stripped of its protective bark and chewed up where chain had held it down during the trip. “Looks like it’s been sitting for a while,” Boxley said, a frown crossing his face. “The bottom end is what I’m concerned about – that it’s wide enough to match the artwork that I drew. The back side has some big knots. … But the carving part of this log looks like it might be good.” A hopeful note. The totem pole’s conception, top to bottom, was already committed to paper, which Cindy had blessed before she died. Now the log was here. After a visit with an 80-inch band saw at a Bremerton mill, it would be delivered to Boxley’s home shop in Lynnwood. There he and his son, David Robert, would set aside their grief and put tools to work. (Click for full image.) The shaman-healer, with rattle in one hand and mortar and pestle in the other, honors Cindy James' caregivers. 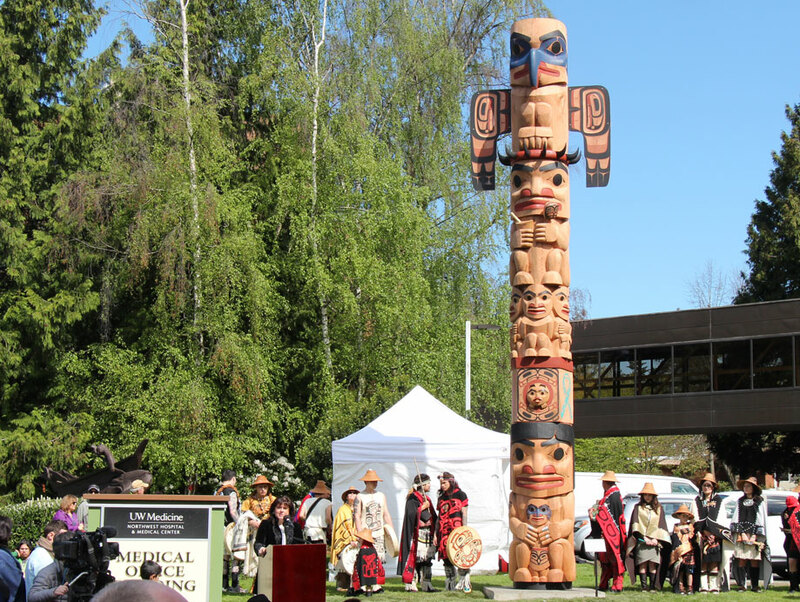 May 6, 2017: Six-plus months later, and with countless hours invested in it, the 27-foot totem was dedicated under a cloudless midmorning sky at Northwest Hospital. Remarkably, an eagle soared overhead during the ceremony, echoing Boxley’s gesture to name the totem “Eagle’s Spirit,” for Cindy’s heritage of the Tsimshian Eagle clan. Hundreds of witnesses included representatives of several tribes of the Pacific Northwest, notably those of Cindy’s heritage: Tlingit, Haida and Tsimshian. Members in formal tribal dress, among them Cindy’s family, paid tribute with drums and dance and voices raw with emotion. David Boxley performs "Carver's Dance" at the dedication. At center of image are Cindy James' mother and sister. picture of David Boxley performing "Carver's Dance" at the dedication. Boxley performed the “Carver’s Dance,” his final duty as the totem’s creator, a few feet from the urn that held his sister-in-law’s ashes. Watching, too, were Cindy's caregivers from Northwest Hospital, in matching blue smocks for the occasion, to remember a patient they called “a force of nature.” They and Cindy’s attending physician, Dr. Kathryn McGonigle, are represented on the pole in the shape of a Native healer. (Click for full image.) Joy Briggs, left, and others from Cindy James' care team in the Surgical Specialties Center. picture of Joy Briggs, left, and others from Cindy James' care team in the Surgical Specialties Center. Patient stays at Northwest Hospital’s Surgical Specialties unit are generally 24 to 48 hours, occasionally stretching to a week or two. It was Cindy James’ home for most of her last two months. “She became like family for everyone who took care of her,” said Joy Briggs, the unit manager. Boxley's oldest tool, an adz whose blade once was a Volkswagen leaf spring. His grandfather picked the alder branch that is the handle. One of the two oldest tools in David Boxley’s workshop is his first adz, which is older than his children. Its blade used to be a leaf spring on a VW bug. “I spent three hours in a junkyard hacksawing this off. My grandfather picked out an alder branch. It still has the bark on it.” Boxley keeps a photo of his grandpa, Albert Bolton, in his wallet so he can keep close the man who helped him carve his first totem. The urn bearing Cindy James' ashes reflects her strong drink preference. Cindy's was Boxley's 77th totem pole. He has started each one, he said, with essentially the same approach (video). This one began three months after he had rotator-cuff surgery on one shoulder; it made a necessity of recruiting relatives and friends for the laborious first step: hollowing out the back of the log (video) and making it roughly 5,000 pounds lighter. People may think of totem poles as art, but to Native Americans they are stories, like a book. "This is the story of Cindy James and her fight with cancer -- and all the other people's fights with cancer. And how wonderful of a dancer she was, how much she loved her grandson, how proud she was of being an Eagle (clan). And how these doctors and nurses took such good care of her, in a losing battle." During the carving process, Boxley shared that, after nearly 40 years carving, seeing a totem pole ascend to its height is exciting every time. Even when he has toiled for months in his workshop and gotten to know every cranny and knot in a pole, seeing it on a vertical plane is awsomely different, he said, and shared his theory (video) about why. (Click to enlarge.) This portrait of Cindy James was painted by Everett, Washington, artist Chris Hopkins and donated to Northwest Hospital.